Please, could you pass this email on to everyone at Honda and HPD. I wanted to take the time before this holiday to thank you and everyone at Honda and HPD for all of the effort and continued hard work that was put in to help me attain my goals and realise a dream of winning both the Indianapolis 500 and the 2005 IRL Championship. I value my relationship with Honda immensely and understand that you certainly play a huge role in this. I am also delighted to know that I will be continuing my relationship with Honda and am excited and very motivated to attain more success in a different situation. It will be strange, I must say, knowing that there will not be the competition between us and other engine manufacturers out there, I always enjoyed that. I would also like to say how proud I was of Matt and “clutch” who worked with me this year. They always pushed me to make sure I had fine tuned everything available to me and because of that I attribute a big part of my success to them also. I look forward to seeing you all at the track next year and wish you a very Merry Christmas and a Happy New Year. "Dan was the best ambassador for Honda we could ever hope for. Not only was he a winner, but he was very engaging, and he worked tirelessly to promote Honda. I have fond memories of meetings with Dan in the pits or engineering trailers at the track, and at HPD. But my favorite memories are from Dan's visit to Honda Hospitality. He felt comfortable there, and made everyone feel comfortable in return. The media, and friends of Honda truly looked forward for Dan and Susie to stop by to visit and relax. They were family. They still are. We will all miss Dan so very much. I hope Susie and the boys will still visit us sometime." 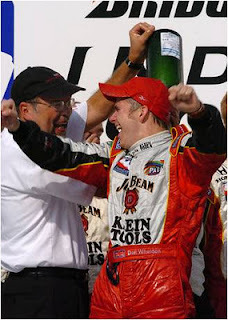 "My best remembrance with Dan has to be our win at the 2004 Indy Japan event at Motegi. As you know, we had failed to win the event on the 6 previous tries. We (HPD) had tried so hard and for so long to win this very impor tant race and it had become a monkey on our back and for many a joke within the paddock. Many were wondering if we would ever win it. Dan was still a young IRL driver and the other AGR drivers always gave him a hard time (see separate story below) and they (Dario, Tony & Bryan) wanted to be the first to win this coveted race for Honda and thereby winning an even more special relationship with Honda. Everyone was so happy when Dan won. All at HPD, HM, HGT, AGR, TRM were so happy and it was a huge celebration. When Dan visited the HM hospitality tent after the race there was a ceremony that included champagne and a beautifully prepared cake. The other AGR drivers decided to put Dan's face in it and from there it turned into a huge food fight. I don't think the Honda Japan staff had ever seen anything like it. Their initial reaction was one of horror (that the cake could be destroyed like that), but many soon joined in on the fun. Of all our victory celebrations over the years (including Indy) I do not think any was a larger or more special one. We had finally won Motegi and we were so proud to have done so for the Japanese Honda fans." "The drivers always had a dinner with Mr. Kawamoto (former president of Honda Motor Co., Ltd.) and Mr. Amemiya (former president and CEO of AHM) on the Thursday night before the race weekend. Because it was Dan's first he had no experience with what it was like. The AGR guys tricked Dan and told him that it was a very formal dinner and that he needed to wear a coat and tie. Dan didn't bring a tie and ended up buying one from the hotel gift shop for something like $100 - it was all they had. Later when they met at the Japanese restaurant adjacent to the hotel Dan found that all the other drivers, and the Japan staff, were in jeans and t-shirts and he walks in dressed in slacks, sports coat and a tie to huge laughter! It was the joke of the paddock that weekend and was reminisced about at all the remaining Motegi events." 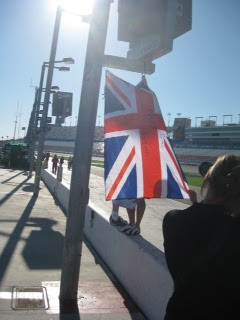 "I have many colorful and wonderful memories of Dan: Years ago, flirting with my daughter at the Honda Hospitality tent at Indy, much to the amusement of my other daughter; joking about his new “un-Brit-like” (his words) teeth on a Drivers Day at HPD; and his amazing finish and victory at the 2011 Indy 500. I have friends in the Tampa/St Petersburg area where Dan lived who have no association with racing yet talk about how he was a shining star in the community he called home who selflessly made himself available to support worthy causes, even donating a wing at the local All Children’s Hospital. 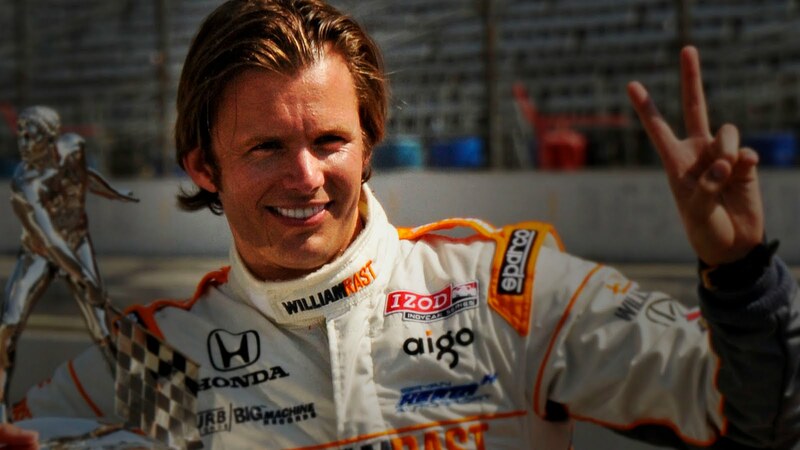 “Dan Wheldon was a great champion – both in sport and in his community,” said a statement from the Bayfront Medical Center in St. Petersburg on Monday, October 17, the day following the accident. Anyone who knew Dan talks about his warmth, ebullience, charm and affability. He was one of the most genuine persons I have ever known; a very special person. I had the privilege of knowing Dan for over five years watching him grow from a young, brash, and highly talented driver into a mature charismatic gentleman, loving husband and father; clearly Susie, Sebastian and Oliver became the center of his universe. Just recently, in the paddock at the Las Vegas Motor Speedway before the incident that took his life, with Susie and the kids in tow, he was talking about The Five Million Dollar Challenge; what he was focused on was not the potential for his own personal gain, but rather about how splitting the purse with some lucky fan would instantly change their life for the better. That was Dan Weldon. He was a great driver and wonderful, generous man. God only knows how much we will miss him. RIP Dan." 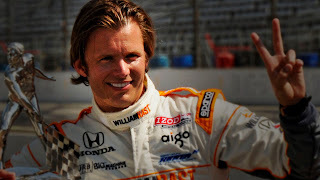 "Dan was a significant contributor to the success that Honda gained with its current IndyCar engine. He was the first to test the engine in the fall of 2002; and, he demonstrated its merits with numerous race victories and Indy 500 wins. Yet it's my memories of him off track that I'll value the most. I first met Dan as an F2000 competitor. He was an amiable young man, frequently smiling; traits which he kept once he made it to the professional ranks. An engaging person who grew up, made it to the big time, and never seemed to loose track of who he was in the process." 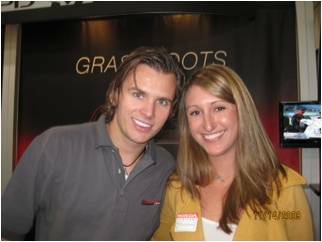 My Dan Wheldon moment occurred after the Centennial Indianapolis 500 this past May. After winning the prestigious race for the second time, Dan had just concluded an exuberant celebratory victory lap at the Indianapolis Motor Speedway. He returned to Victory Circle to begin the Hat Dance -- that incessant procession of ballcaps and photo ops, which, for understandable reasons, lasts about five times as long at Indianapolis as at any other track on the IndyCar Series circuit. Dan had just stepped into the cockpit, and had the first hat in hand, when he looked to his left and saw me standing along the railing that divided the race car from the rabble. He placed the hat on the car's nose, got out, walked around to my side of the car and grabbed me. I barely remember what he said to me, but I do remember hearing a loud cheer from the grandstand above us in Victory Circle. And I remember thinking, "That's pretty cool. Some people I know are happy that I'm getting this moment." It wasn't until we separated, and Dan resumed the headwear ritual, that I looked above me to see that I did not recognize a single face among those who had been doing the cheering. Whether or not it is true, I'm going to continue in the belief that those spectators were paying tribute to the emotion of a moment between the Indianapolis 500 winner and some guy none of them had ever met. And that blew me away. Just before he returned to his car, Daniel and I spent time crying in each other's arms. We were crying tears of joy, feeling all the pain and all the hard work it took to get to that moment, and celebrating all the promise the future would hold for him. After last Sunday afternoon, I am not ashamed to admit, I have cried in many other arms, as well.